ST. GEORGE – While Gov. 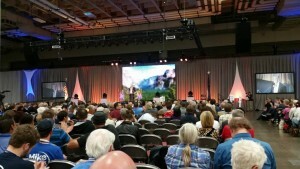 Gary Herbert was forced into a primary by challenger Jonathan Johnson during the Republican state convention Saturday, Democratic gubernatorial nominee Mike Weinholtz told party delegates his wife is facing a criminal investigation for cannabis use. 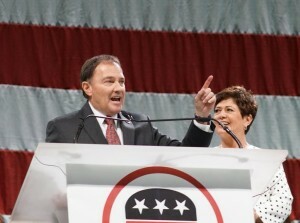 Both the Utah Republican and Democratic state conventions were held at the Salt Palace in Salt Lake City Saturday. While a number of races went uncontested and candidates were nominated by acclimation, others faced off as the delegates voted. Some candidates came through with solid victories while others will go to primary. Due to the Count My Vote compromise legislation of 2014, often called SB 54, candidates who gathered enough signatures will appear on the primary ballot regardless of winning or losing at the convention. Under the Count My Vote compromise, recently found by a federal court to be constitutional, candidates no longer need 60 percent of the delegates’ votes for a primary to occur but can force one by gathering a number of required signatures. Johnson won 55 percent of the delegate vote to Herbert’s 44 percent in two rounds of voting. Candidates Nate Jensen and Carlos Tavares were knocked out in the first round. “I am ecstatic and enthused at today’s tremendous win. Today’s victory is a testament that delegates and voters know Utah can do it better,” Johnson said in a statement following the convention. Herbert told Fox 13 News that he was happy to move on to the primary so he could go the state’s 600,000 Republican voters and not just the party’s 4,000 delegates. The state primaries will be held June 28. Read more about Johnson’s forcing Herbert into a primary. On the Democrat side of the Salt Palace, Mike Weinholtz took 80 percent of the vote to Vaughn Cook’s 20 percent to secure the nomination. While addressing the delegates, Weinholtz said his wife had come under investigation for the possession of marijuana. 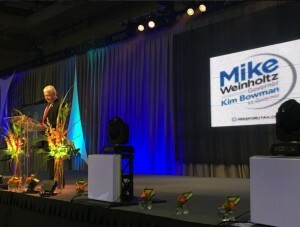 “In the last 72 hours, we learned that my wonderful wife of 20 years, Donna, is under investigation for possession of marijuana,” Mike Weinholtz told the delegates, as reported by Fox 13 News. Donna Weinholtz told Fox 13 News she and her husband wanted to be transparent with voters about it the issue. Medicinal cannabis use was recently the topic of a symposium held at Dixie State University sponsored by the Dixie Student Nursing Association. Incumbent Republican Rep. Rob Bishop, who represents Utah’s 1st Congressional District, won the party nomination with 82 percent of the vote to challenger David Yu-Lin Chu’s 18 percent. Republican Rep. Jason Chaffetz, who currently represents Utah’s 3rd Congressional District, won his party’s nomination with 64 percent of the delegate vote. However, he still faces a primary against challenger Chia-Chi Teng, who collected the required signature count to make it onto the primary ballot. David Damschen won the Republican nomination for state treasurer with 83 percent of the vote over challenger Merrill Cook. For the Democrats, U.S. Senate candidates Jonathan Swinton and Misty Snow will face each other in a primary. The one that prevails will go on to face Sen. Mike Lee, the Republican incumbent. The remaining races were uncontested with party nominations approved through acclimation. In one of the odder nuggets of news to come out of the Republican convention – someone glued the padlock on the back of a box truck containing Herbert’s campaign signs so it could not unlock. St. George News/Cedar City News reporter Tracie Sullivan contributed to this article.